Nigerians have begun to flee their homes in droves for neighboring Cameroon seeking refuge from the jihadist terror group Boko Haram. A three-day siege upon the town of Gamboru, in northeastern Borno state, led its residents to flee across the border to Cameroon border, where a burgeoning refugee crisis is developing. Boko Haram killed over 29 people attempting to flee their latest attack, but 215 youths made it to Fotokol, Cameroon, 141 miles from Gamboru. These youths told officials what residents endured in three days. 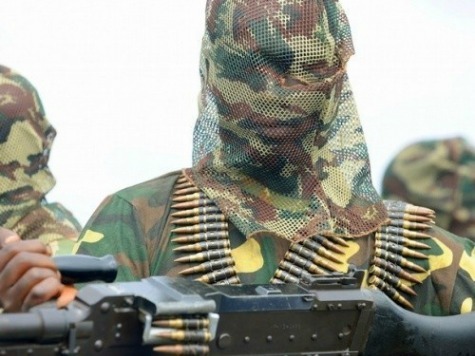 Boko Haram forced people between 18 and 25 to fight against the Nigerian and Cameroon army. If anyone resisted, they were slaughtered immediately. Cameroon registers anyone from Nigeria who fled because of Boko Haram. Kerawa is on the border and a constant target of Boko Haram. Boko Haram is based in northeast Nigeria, mainly in Borno State. Gamboru and Maiduguri, Borno State’s capital, are popular targets. In 2013, the terrorists attacked pharmacies, raising medicine prices. In May, over 300 people died after the group attacked Gamboru and Ngala for two days. The militants destroyed a bridge that connected Gamboru to Nigeria [do you mean Cameroon? Gamboru is in Nigeria] just a few days later.